250 ml Alhydrogel 2% is provided as a ready-to-use, aluminium hydroxide wet gel (colloidal) suspension. Alhydrogel is sterilized by autoclavation and aseptically filled. Alhydrogel 2% is shipped at room temperature and should be stored at room temperature. Product is stable for 6 months. DO NOT FREEZE. Note: Do not expose to frost as product will be destroyed if ice crystals form in the gel. Alhydrogel is an aluminium hydroxide (referred to as alum) wet gel suspension. Alum improves attraction and uptake of antigen by antigen presenting cells (APCs). Recently, it has been suggested that the antigens adsorbed on the aluminum salts are presented in a particulate form, making them more efficiently internalized by APCs. Moreover, alum activates the NLRP3 inflammasome complex implicated in the induction of several pro-inflammatory cytokines including IL-1β and IL-18. Alum increases Th2 antibodies but does not promote significant Th1 cellular response. Alhydrogel 2% was elected as the International Standard Preparation for aluminium hydroxide gels. Alhydrogel 2% is present in multiple commercial vaccine formulations. Antigens are preferentially diluted in saline or phosphate buffers. The amount of protein or conjugated peptide used for the primary immunization can be adjusted depending upon availability and immunogenicity of the antigen. For example, mice can be injected subcutaneously (s.c.) with 1 to 10 μg of endotoxin-free ovalbumin. 1. Shake well the capped bottle of Alhydrogel 2% before use. 2. Add Alhydrogel 2% to the antigen solution; the final volume ratio of Alhydrogel 2% to antigen should be 1:1 (100 μl Alhydrogel 2% for 100 μl of antigen) to 1:9 (100 μl Alhydrogel 2% for 900 μl of antigen). 3. Mix well by pipetting up and down for at least 5 minutes to allow Alhydrogel 2% to effectively adsorb the antigen. The volume of injection depends on the site of administration. For example, 100-200 µl can be injected s.c. in mice. 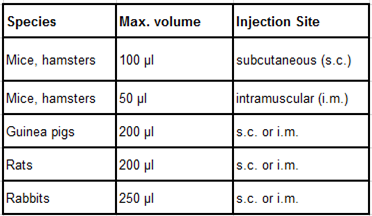 Recommended maximum volumes for injection of antigen/adjuvant mixtures per site of injection for laboratory animals.